Living near the US/Canada border, I frequently go across to the US and end up buying gas. But, as any border hopper knows, converting between gallons and litres in your head and accounting for the exchange rate can be challenging. So, for that, I made a tiny website to do the calculation for you: convertgasprice.com. By default, the countries are set to Canada and the United States. But I've added several other countries. Most of the world sells fuel in litres, but a handful still use gallons. Other than the US, Belize, Honduras, Guatemala, El Salvador, and a few others sell fuel in gallons. If the default countries don't work for you, select the countries you need, then check the box to save your selection for future visits. Later, just load the site, type the price, and see the conversion. On your smart phone, you can bookmark the site to your home page, and you'll have a pretty icon there to use later. If you're in Europe, and buy petrol instead of gas, you can use convertpetrolprice.com instead. The default countries are UK and Ireland, though that really just converts pounds to euros since both sell petrol in litres. 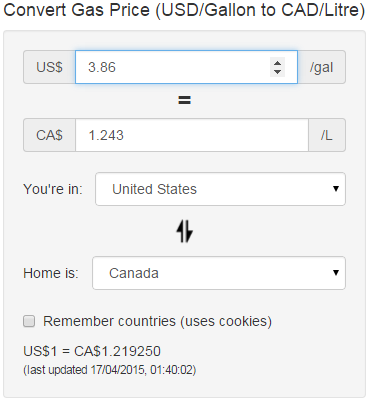 Exchange rates are updated nightly (thanks to currencylayer.com - you rock). If you use it and like it, let me know in the comments. If you have any suggestions for added features, let me know that too!